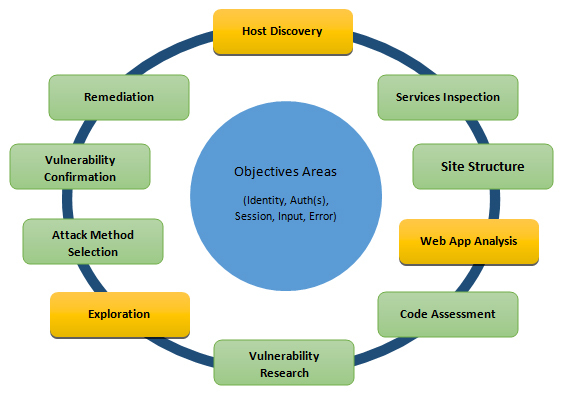 It’s the process to identify security vulnerabilities in an application by evaluating the system or network with various malicious techniques. The weak points of a system are exploited in this process through an authorized simulated attack. The purpose of this test is to secure important data from outsiders like hackers who can have unauthorized access to the system. Once the vulnerability is identified it is used to exploit the system in order to gain access to sensitive information. A penetration test is also known as pen test and a penetration tester is also referred as an ethical hacker. We can figure out the vulnerabilities of a computer system, a web application or a network through penetration testing. A penetration test tells whether the existing defensive measures employed on the system are strong enough to prevent any security breaches. Penetration test reports also suggest the countermeasures that can be taken to reduce the risk of the system being hacked. Design and development errors: There can be flaws in the design of hardware and software. These bugs can put your business-critical data at the risk of exposure. Poor system configuration: This is another cause of vulnerability. If the system is poorly configured, then it can introduce loopholes through which attackers can enter into the system & steal the information. Human errors: Human factors like improper disposal of documents, leaving the documents unattended, coding errors, insider threats, sharing passwords over phishing sites, etc. can lead to security breaches. Connectivity: If the system is connected to an unsecured network (open connections) then it comes in the reach of hackers. Complexity: The security vulnerability rises in proportion to the complexity of a system. The more features a system has, the more chances of the system being attacked. Passwords: Passwords are used to prevent unauthorized access. They should be strong enough that no one can guess your password. Passwords should not be shared with anyone at any cost and passwords should be changed periodically. In spite of these instructions, at times people reveal their passwords to others, write them down somewhere and keep easy passwords that can be guessed. User Input: You must have heard of SQL injection, buffer overflows, etc. The data received electronically through these methods can be used to attack the receiving system. Management: Security is hard & expensive to manage. Sometimes organizations lack behind in proper risk management and hence vulnerability gets induced in the system. Lack of training to staff: This leads to human errors and other vulnerabilities. Communication: Channels like mobile network, internet, telephone opens up security theft scope. You must have heard of the WannaCry ransomware attack that started in May 2017. It locked more than 2 lakh computers around the world and demanded ransom payments in the Bitcoin cryptocurrency. This attack has affected many big organizations around the globe. With such massive & dangerous cyber-attacks happening these days, it has become unavoidable to do penetration testing on regular intervals to protect the information systems against security breaches. – Financial or critical data must be secured while transferring it between different systems or over the network. – Many clients are asking for pen testing as part of the software release cycle. – To secure user data. – To find security vulnerabilities in an application. – To discover loopholes in the system. – To assess the business impact of successful attacks. – To meet the information security compliance in the organization. – To implement effective security strategy in the organization. It’s very important for any organization to identify security issues present in internal network and computers. Using this information organization can plan a defense against any hacking attempt. User privacy and data security are the biggest concerns nowadays. Imagine if any hacker manages to get user details of social networking site like Facebook. The organization can face legal issues due to a small loophole left in a software system. Hence, big organizations are looking for PCI (Payment Card Industry) compliance certifications before doing any business with third-party clients. In this test, attempts are being made to make a person reveal the sensitive information like password, business-critical data, etc. These tests are mostly done through phone or internet and it targets certain helpdesks, employees & processes. Human errors are the main causes of security vulnerability. Security standards and policies should be followed by all staff members to avoid social engineering penetration attempt. Example of these standards includes not to mention any sensitive information in the email or phone communication. Security audits can be conducted to identify and correct process flaws. Using software methods one can verify if the application is exposed to security vulnerabilities. It checks the security vulnerability of web apps and software programs positioned in the target environment. Strong physical security methods are applied to protect sensitive data. This is generally used in military and government facilities. All physical network devices and access points are tested for possibilities of any security breach. This test is not much relevant to the scope of software testing. This is one of the most commonly performed penetration tests where the openings in the network are identified by which entry is being made in the systems on the network to check what kind of vulnerabilities are there. It can be done locally or remotely. It aims to search and exploit vulnerabilities in client-side software programs. It searches for modems in the environment and tries to login to the systems connected through these modems by password guessing or brute forcing. 7) Wireless security test: It discovers the open, unauthorized and less secured hotspots or Wi-Fi networks and connects through them. Black Box Penetration Testing: In this approach, the tester assesses the target system, network or process without the knowledge of its details. They just have very high level of inputs like URL or company name using which they penetrate into the target environment. No code is being examined in this method. White Box Penetration Testing: In this approach, the tester is equipped with complete details about the target environment – Systems, network, OS, IP address, source code, schema, etc. It examines the code and finds out design & development errors. It is a simulation of internal security attack. Grey Box Penetration Testing: In this approach, the tester has limited details about the target environment. It is a simulation of external security attack. The third process is more common to identify all kinds of vulnerabilities. Automated tools can be used to identify some standard vulnerability present in an application. Pentest tools scan code to check if there is malicious code present which can lead to the potential security breach. Pentest tools can verify security loopholes present in the system by examining data encryption techniques and figuring out hard-coded values like username and password. – It should be easy to deploy, configure and use. – It should scan your system easily. – It should categorize vulnerabilities based on severity that needs an immediate fix. – It should be able to automate verification of vulnerabilities. – It should re-verify exploits found previously. – It should generate detailed vulnerability reports and logs. Once you know what tests you need to perform you can either train your internal test resources or hire expert consultants to do the penetration task for you. Limitations of Pentest tools: Sometimes these tools can flag false positive output which results in spending more developer time on analyzing such vulnerabilities which are not present. It’s difficult to find all vulnerabilities using automated tools. There are some vulnerabilities which can be identified by manual scan only. Penetration testers can perform better attacks on application based on their skills and knowledge of the system being penetrated. The methods like social engineering can be done by humans only. Manual checking includes design, business logic as well as code verification. Let’s discuss the actual process followed by test agencies or penetration testers. Identifying vulnerabilities present in the system is the first important step in this process. Corrective action is taken on these vulnerability and same penetration tests are repeated until the system is negative to all those tests. 1) Data collection: Various methods including Google search are used to get target system data. One can also use the web page source code analysis technique to get more info about the system, software and plugin versions. There are many free tools and services available in the market which can give you information like database or table names, DB versions, software versions, hardware used and various third-party plugins used in the target system. 2) Vulnerability Assessment: Based on the data collected in the first step one can find the security weakness in the target system. This helps penetration testers to launch attacks using identified entry points in the system. 3) Actual Exploit: This is a crucial step. It requires special skills and techniques to launch an attack on the target system. Experienced penetration testers can use their skills to launch an attack on the system. 4) Result analysis and report preparation: After completion of penetration tests detailed reports are prepared for taking corrective actions. All identified vulnerabilities and recommended corrective methods are listed in these reports. You can customize vulnerability report format (HTML, XML, MS Word or PDF) as per your organization needs. Remember this is not functional testing. In Pentest your goal is to find security holes in the system. Below are some generic test cases and not necessarily applicable for all applications. 1) Check if the web application is able to identify spam attacks on contact forms used on the website. 2) Proxy server – Check if network traffic is monitored by proxy appliances. Proxy server makes it difficult for hackers to get internal details of the network thus protecting the system from external attacks. 3) Spam email filters – Verify if incoming and outgoing email traffic is filtered and unsolicited emails are blocked. Many email clients come with inbuilt spam filters which need to be configured as per your needs. These configuration rules can be applied to email headers, subject or body. 4) Firewall – Make sure entire network or computers are protected with Firewall. A Firewall can be a software or hardware to block unauthorized access to a system. A Firewall can prevent sending data outside the network without your permission. 6) Verify that all usernames and passwords are encrypted and transferred over secured connection like https. 9) Verify if there is no open port in the network. 13) Verify all HTTP methods. PUT and Delete methods should not be enabled on a web server. 14) Verify if the password meets the required standards. The password should be at least 8 characters long containing at least one number and one special character. 22) Verify use of registry entries. Sensitive information should not be kept in the registry. 23) All files must be scanned before uploading to the server. 25) There should not be any hardcoded username or password in the system. 35) Verify that directory browsing is disabled on the server. 37) Verify URL manipulation to check if a web application is not showing any unwanted information. 40) Verify if the system is safe from Brute Force Attacks – a trial and error method to find sensitive information like passwords. 41) Verify if system or network is secured from DoS (denial-of-service) attacks. Hacker can target network or a single computer with continuous requests due to which resources on target system gets overloaded resulting in the denial of service for legit requests. 42) Verify application for HTML script injection attacks. 43) Verify against COM & ActiveX attacks. 44) Verify against spoofing attacks. Spoofing can be of multiple types – IP address spoofing, Email ID spoofing, ARP spoofing, Referrer spoofing, Caller ID spoofing, Poisoning of file-sharing networks, GPS spoofing. 45) Check for uncontrolled format string attack – a security attack that can cause the application to crash or execute the harmful script on it. 46) Verify XML injection attack – used to alter the intended logic of the application. 47) Verify against canonicalization attacks. 48) Verify if the error pages are displaying any information that can be helpful for a hacker to enter into the system. 49) Verify if any critical data like the password is stored in secret files on the system. 50) Verify if the application is returning more data than it is required. These are just the basic test scenarios to get started with Pentest. There are hundreds of advanced penetration methods which can be done either manually or with the help of automation tools. Finally, as a penetration tester, you should collect and log all vulnerabilities in the system. Don’t ignore any scenario considering that it won’t be executed by end users.